'Tis the season! For ghouls and ghosts and goblins, that is. And what holiday would be complete without seasonal cupcakes to liven up the party? I have been utterly inspired by the Halloween cupcakes I've seen by my favorite local cupcake shop, Trophy Cupcakes. Just check out their twitter stream for some mouthwatering pictures of vampires, Frankenstein, and witch hats. But remember that you don't need expert piping skills or art classes to make great spooky designs--their candy corn cupcakes are one of my favorites because they're so easy and yet so effective. I made these cupcakes last Halloween, and I've been waiting until now to share them with you. So bake up a dozen chocolate cupcakes, pull out your food colors and assorted candies, and we're off! 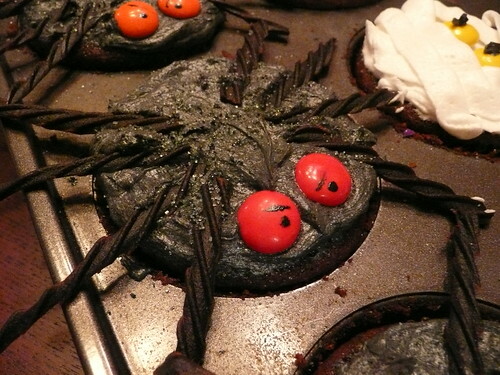 To make spiders: Spread grey/black frosting on the top of a cupcake. Cut black licorice into quarters lengthwise with kitchen shears or a really sharp knife, then cut each skinny licorice bit into 1-2" pieces. Press four licorice pieces into the frosting on each side of the cupcake. You can use any small colored candies for the eyes--I used M&Ms because they were available. Stick a toothpick in black food coloring and use it like a pen to draw a mean expression on the eyes. (Edible decoration markers would almost certainly be easier if you happen to have them, but I didn't bother.) In a small nonporous bowl, toss a tablespoon of white sugar with a few drops of black food coloring. 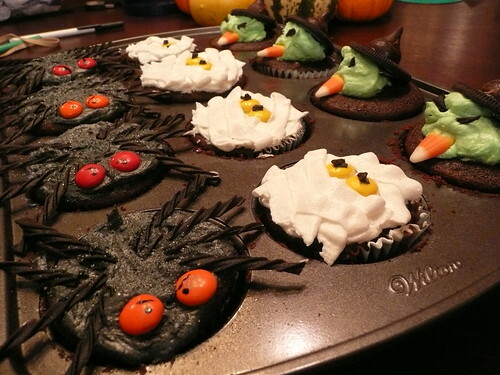 Sprinkle the dyed sugar over the cupcakes to make "shiny" spider bodies. 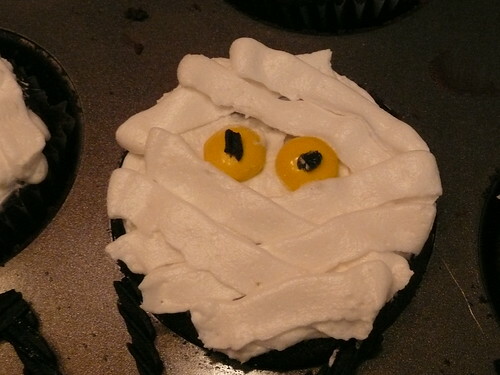 To make mummies: Spread a thin layer of white frosting over your cupcake. Put two candies about 1/3 of the way down to be eyes. Using a flat piping tip (such as Wilton #44 or 45), pipe short flat strips of frosting to mimic bandages, leaving the eye area open. Vary the direction of your strokes and use overlapping diagonals to make the mummy look "wrapped." Attach a very small piece of licorice to the eyes with a dab of frosting, or just use the toothpick-in-food-coloring trick from the spiders to create pupils. 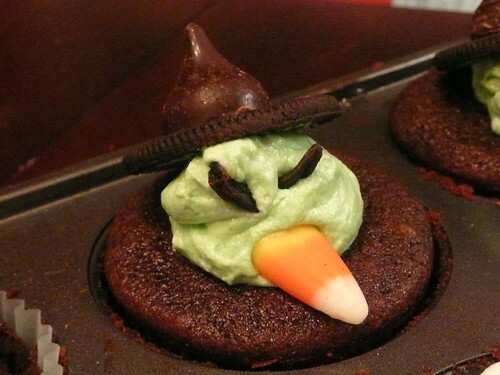 To make witches: Using a dinner spoon, put a blob of thick green frosting down in the middle of your cupcake. (Mix in a bit more powdered sugar if your frosting is too thin to stand on its own; you don't want the witch heads to turn into puddles.) Open an Oreo, scrape off the white filling, and unwrap a Hershey's kiss. Attach the two with a dot of frosting to make a hat, and set them at a jaunty angle on your green blob. Press a piece of candy corn in near the bottom to be a nose, and use two slivers of black licorice tilted inwards to make mean-looking eyes. Et voila! 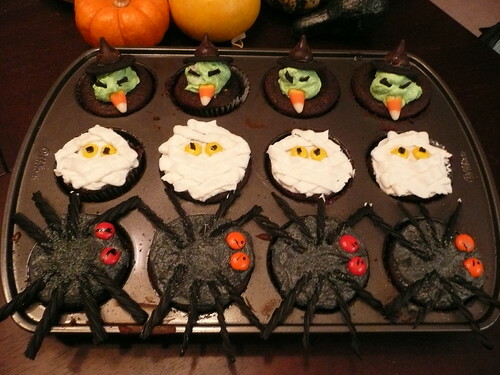 Adorable Halloween cupcakes/edible decorations for your dinner table. Perfect. Do you have any other Halloween decorating ideas? I'll be making a batch of cupcakes tomorrow and would love to give them a try. And yet, instead of you making cupcakes, I made cookies. Interesting.